AmiWebView 2 is a webcam viewer for AmigaOS 4. With this software it's possible to show and manage web cams with a very user friendly ReAction GUI. AmiWebView has different functions to record web cams an show them on your Workbenchscreen. For example you can create a time lapse movie or you can display your current webcam as the workbench background. AmiWebView 2 is available via E-Mail or CD. The E-Mail version costs only 5,95 Euro and the CD version 9,95 Euro. Order at once from our OnlineShop. 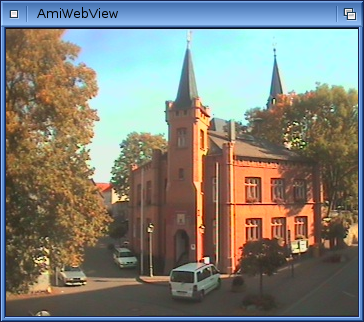 AmiWebView 2 is a programme to manage and show webcams on AmigaOS 4 with comfortable handling and a lot of useful functions. Local files exist for the languages German, Englisch, Spanish and French. More languages will come. "AmiWebView2 lets you easily manage and display your webcams..."